Alanda May 16, 2017 16 Comments This post may contain affiliate links. 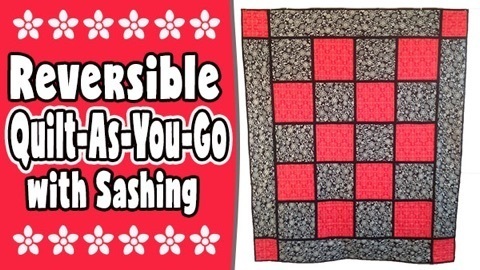 This is a ‘quilt as you go with sashing‘ quilt. The sashing is added as you piece it together. It is fully reversible and looks great in either soft vintage materials or bright moderns colours. NOTE: I have worked out the yardage based on a 40″ width of fabric. If your fabric is wider you may be able to get 4 squares across the wof instead of the 3 squares that I have used in the calculation. Hence you may need a little less fabric. 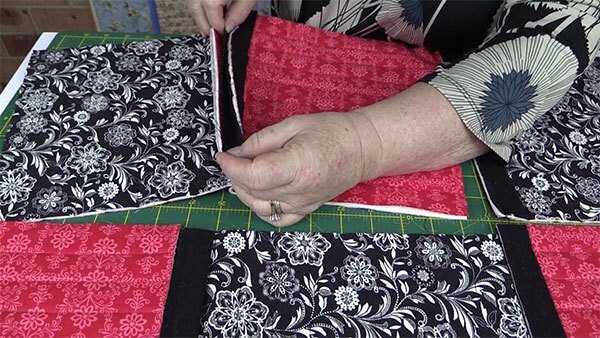 Personally I would rather have little extra which I can use at a later stage in a crumb quilt or strip quilt. 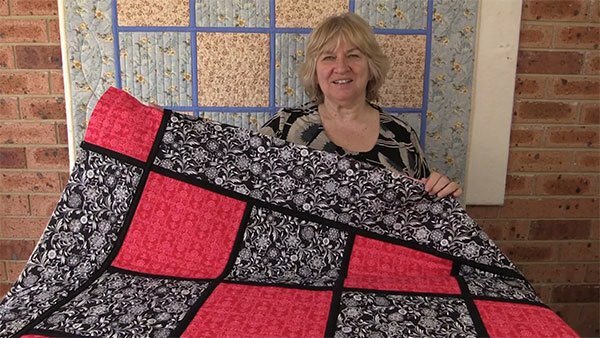 Create a quilt sandwich with 1 square of each colour and 1 square of batting. Colour 2 – right side facing up. Line up the edges of the fabric and the batting. Quilt as you wish or do some line quilting as we have done. Also watch the video below for more info. 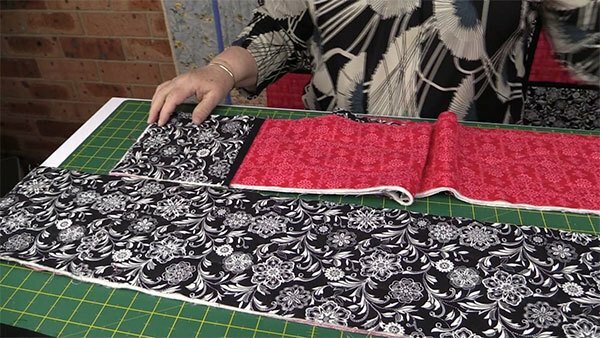 Draw lines 1″ apart on the lighter coloured fabric. Line the square up on the mat so that you have approx ¼” on either side. This will give you a centre line at 5″. 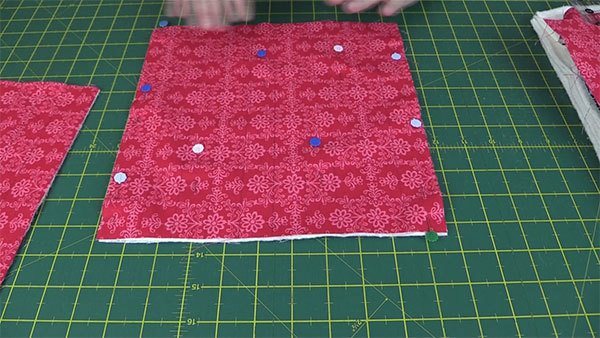 Pin the three layers together to keep everything in place while you sew. Sew along the drawn lines. Repeat for all the squares. Trim the squares to 10″. Check the video for 2 different methods on how to do this. Short Sashing Pieces for centre squares. 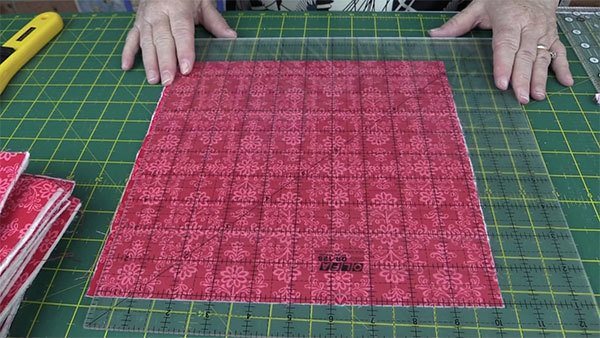 Fold the 2″ strips in half and press to get a nice crisp fold. 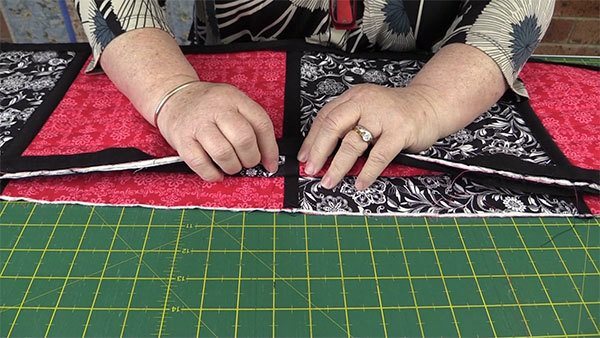 Place a 1″ sashing strip to the back of the quilt square and the folded strip to the front of the quilt square. Make sure the raw edges are all lined up. The folded edge of the 2″ strips should be facing away from the edge. 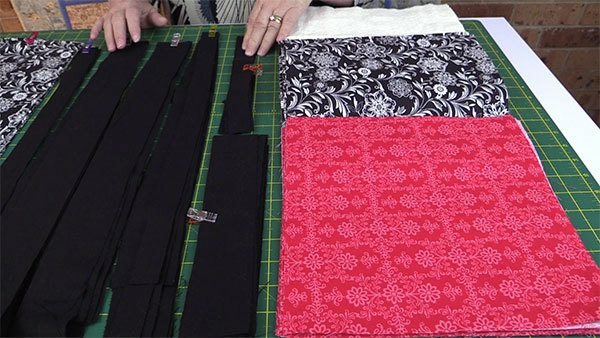 Sew the quilt sandwich with the sashing in place with a ¼” seam. Do this with all 20 squares. Lay out the squares how you want them to look. Now we need to join the squares into rows. This step is a little tricky so I suggest you watch the video below to see exactly how this is done. Line up the 1″ strip from the 1st block along the edge of the next block. Pin in place along the edge. Place the loose sashing piece over the seam lines. You will notice that the seams will fill the space. Topstitch the sashing in place, close to the folded edge. Join all the blocks into rows in the same way. 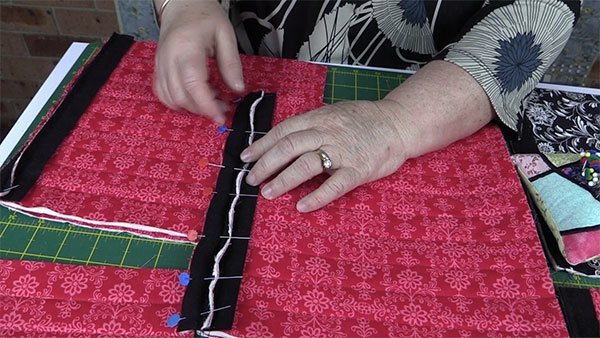 Once all the blocks have been sewn into rows add the long sashing pieces to join the rows together in the same way. as you joined the blocks together. 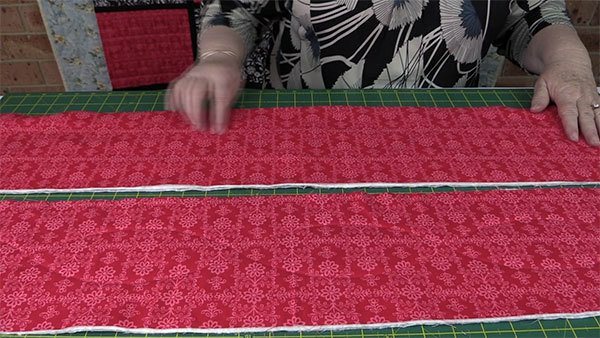 When joining the rows together make sure you line up the sashing strips. Sandwich the pieces together the same way you did when you created the blocks. These layers need to be quilted. You can do this in any way you wish, I have chosen to create curved lines. 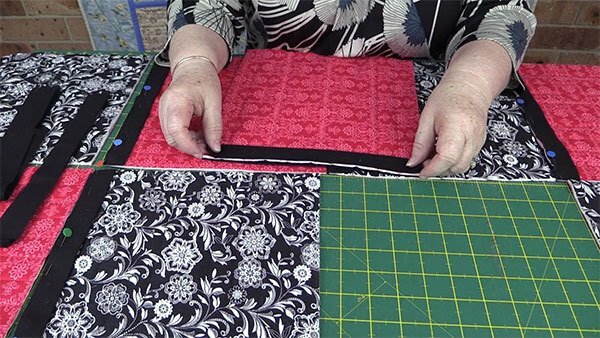 You could also quilt the border in the same way you did the blocks, with 1″ lines. Attach the borders to the centrepiece in the same way as you joined the blocks together. Sandwich the batting between one border fabric in colour 1 and one border fabric in colour 2. Quilt as before. Again I am using my Leaves Galore Ruler to create some curved lines. I have used line quilting on the cornerstones, 1″ apart, the same as on the blocks. Attach the sashing to the cornerstones in the same manner as we added the sashing to the squares. Sew the cornerstone pieces to the border piece. 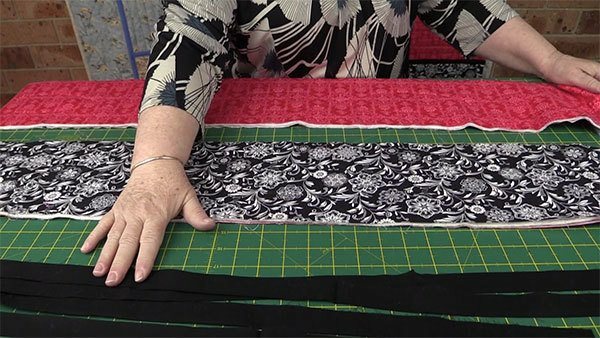 Attach the 63″ sashing pieces to the long borders along the side edges of the quilt using the same method that we used previously. Sew the borders to the quilt. Add the binding and you’re done. 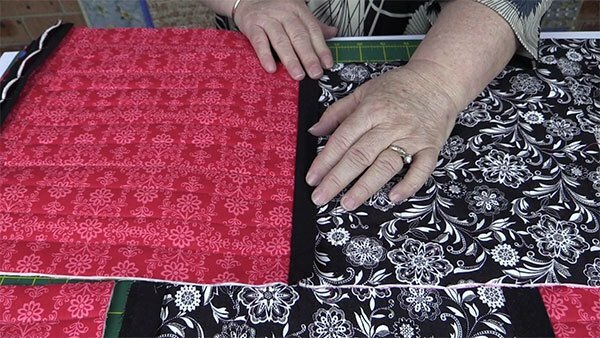 If you need help with adding the binding, here is a link to our tutorial on How to bind a quilt using your sewing machine. I stink at math…how much fabric for a king size quilt? Wish we could help Cindy, but we get asked quite often for different measurements for our projects and unfortunately we just don’t have the time to sit down and calculate them all. It can take a bit of work as we aren’t that great at maths ourselves. 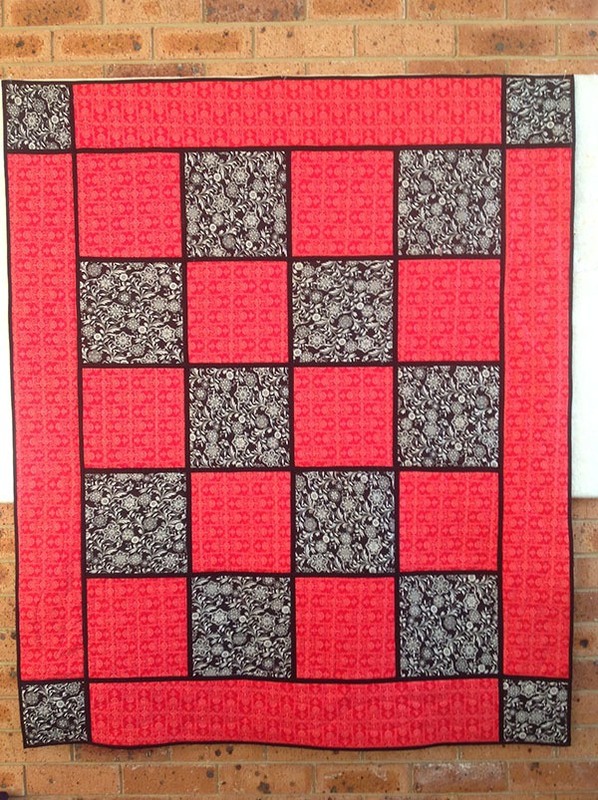 I recently made a king size quilt, and after quilting it the traditional machine way, I vowed never to do it again. 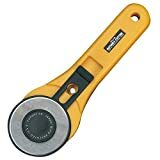 I think I did permanent wrist damage stuffing that thing through my small arm machine! But, I really loved every other aspect of making the quilt. After watching your video and following your link to this tutorial, I have decided to make this one. And I am REALLY looking forward to it! Thank you so much for this tutorial, as well as the simple/beautiful color scheme idea! I can sew just about anything you throw my way, but I cannot for the life of me color coordinate. red/black is just up my alley though!! That’s nasty Lisa, but I’m glad it hasn’t put you off quilting. 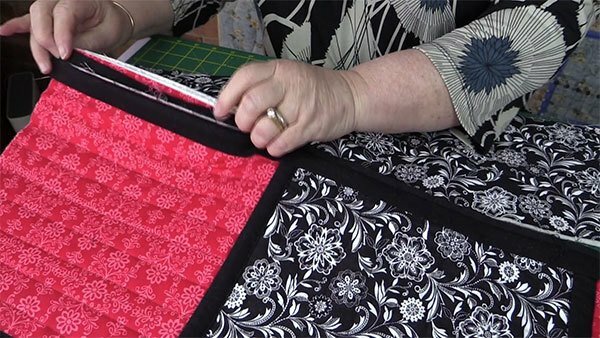 The biggest challenge, as you have experienced, is quilting on a small home machine. I work on a table so that I have some flat space for the quilt to lay on, and then I roll the quilt up to feed it into the throat of the machine. King sized quilts are a real challenge. A colour wheel helps with colour co-ordinating and they are relatively inexpensive. 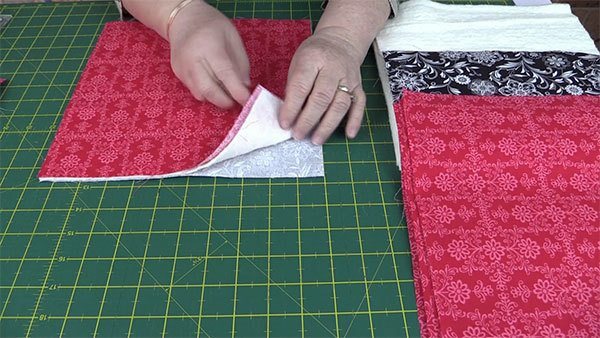 Just wanted to say this is the best step by step of showing how to make a quilt that I have seen. I have been looking everywhere on line how to do a photo quilt. I’m sure this would be done the same way. Except I want the sash to be two and half inch wide not sure if I can do this and also don’t know if I would need to add batting to the sash and how could I do this . I would greatly appreciate if you could please help me, I can’t find the answer anywhere. 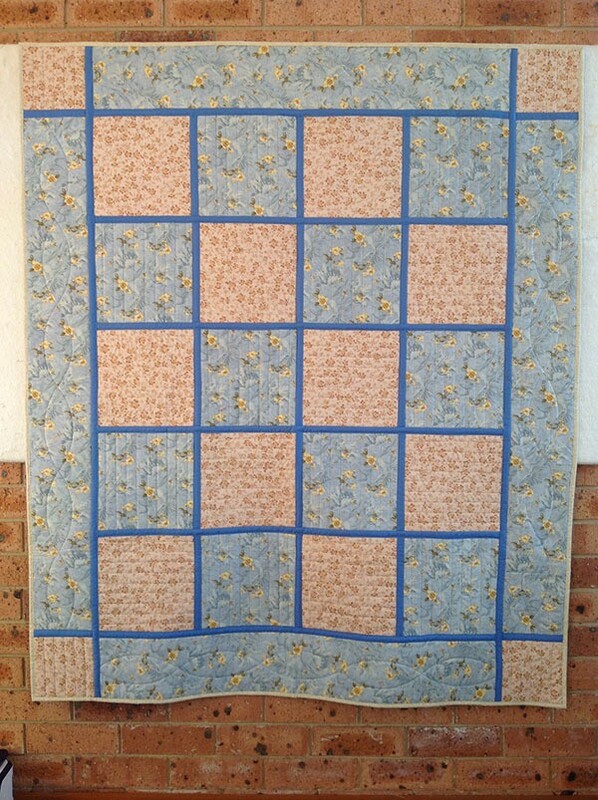 This is only my second quilt. Thank you again for such a great tutorial. And thank you for your lovely comment. Glad we could help. 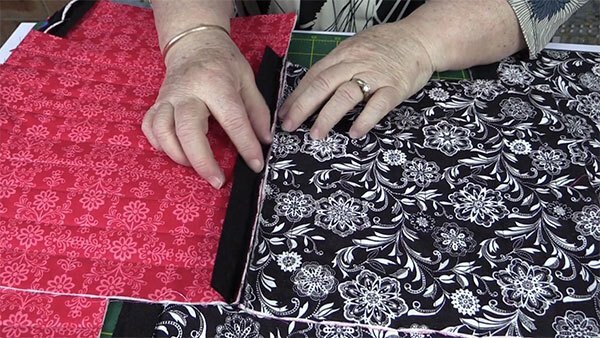 Going to try this scrappy as a trial run…..best tutorial for quilt as you go that I have found…others are confusing to a old lady. Thx soooo much!!! The best QAYG tutorial & vid I’ve found!! Now, maybe I can progress from mug rug to baby sized projects. Thank you so much for this tutorial! I am going to try it but I have cornerstones in my sashing and am not sure about that. I guess I will learn as I go! Thank you again. Cornerstones would look great but with this method I’m not sure how you would do that easily.